March is Languedoc-Roussillon Month on TheWineStalker.net! This month I'm taking a tour of the Languedoc-Roussillon in southern France from the comfort of my own home! I've got ten wines from the region; six from Roussillon and four from Languedoc. As you probably know, it's been rather difficult to keep this blog going lately so these reviews will be short and sweet. Next stop is Corbières! Corbières is the largest region in not only the Languedoc but the entire Languedoc-Roussillon, and it accounts for 45% of its AOC production. It borders the north of Roussillon and, because of its size, has many different soils and microclimates. At least two varieties must be in a Corbières red wine, and your choices are a minimum of 50% Grenache, Lledoner Pelut, Mourvèdre and/or Syrah, then maximum of 20% Carignan, Picquepoul noir, and/or Terret noir, and then you can add no more than 20% Cinsaut or 10% Grenache gris if you like. 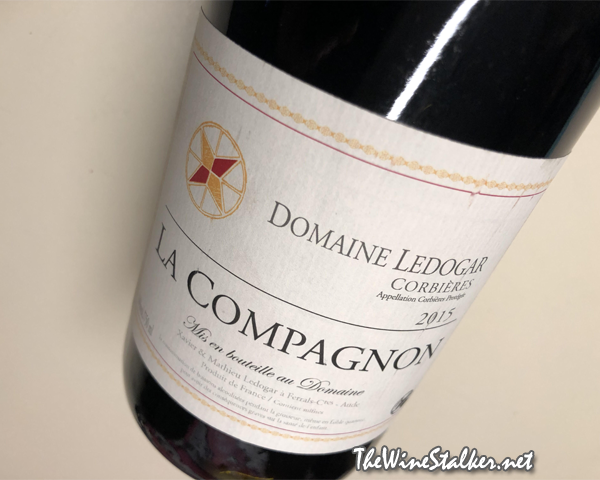 The La Compagnon Corbières 2015 is 60% Grenache and 10% Syrah that were fermented alone, and a 30% combo of Carignan and Mourvèdre fermented together. The vines are on clay limestone, sandstone and red clay at the edge of a pine forest. The final wine is organic and biodynamic, and has an ABV of 14%. On the pour I was very surprised at how inky the wine is in its purplish-red color. On the nose there's aromas of plum, cherry cola, black olive, and a slight touch of barnyard funk. In the mouth it's medium bodied with a rich mouthfeel and chalky tannin. There's flavors of plum, black cherry, aspirin, and bay leaf; and every once in awhile the acidity lifts the fruit into cranberry. Then it finishes with black cherry, what I can only describe as "creamed tea", and a mouthful of that chalky tannin. Hell to the yeah. This is some damn good stuff. Everybody recommends that this wine is best paired with lamb and I absolutely have to agree, but I've got a suspicion that it's also fantastic with Shake 'n Bake pork chops. Make Dark Horse Pinot Noir from home! Wine Reviews: Best of Winter 2017/18!